The Asian Box Turtle belongs to the Geoemydidae family, specifically of the genus Cuora. There are about eleven species in this genus, and other subspecies. These turtles usually show off very bright body colors, with a distinguishing stripe. However, the exact color is variable, which can range from bright yellow, white or orange. Many turtles of this genus have a color stripe from the side of their heads all the way down to their nose. 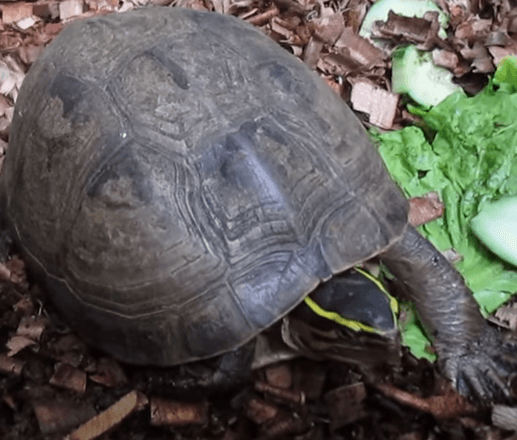 Where is the Asian Box Turtle Found? The Genus Cuora can be found in South East Asian countries such as China, Indonesia and the Philippines. Asian box turtles are terrestrial, they can be either mainly aquatic or semi aquatic, depending on their species. These turtles can be found at the edge of streams, ponds or shallow swamps. You can locate them in their native habitat where there is dense vegetation. Asian box turtles can feed on a variety of food. While most of them are omnivorous, there are some species that are carnivorous. They can eat meal worms, lettuce, tomatoes, a variety of fruit and commercial turtle pellets. A variety of food is a good idea. Calcium supplements are also recommended for the Asian box turtle. These turtles used to be available in the market for exotic animal trade. They have been captured and also sold to Asian food markets illegally. Although, some have been rescued and imported to different parts of the world, there are some species that are considered very rare, and others that are already extinct. In the United States, there are some groups that are already producing offspring which are dispersed in pet trade. This little turtle is an amazing species like no other. These little turtles can grow up to twelve inches long, whereas smaller species only grow up to seven inches. Regardless of its size, the Asian box turtle's shell is very powerful, yet it is still a gentle animal. It is very popular among pet lovers and animal enthusiasts. It makes a great first pet for little children who would like to care for a small and low-maintenance animal. Caring for a box turtle will require at least a twenty-gallon tank or large plastic tub. This type of container can house up to two Asian box turtles. It is also possible to use smaller ambos for raining baby turtles. These turtles enjoy swimming. It is important that their habitat set-up consists of both land and water. The water quality is essential with keeping any turtle; it needs to be clean and cool. The Asian box turtle, if kept in ideal conditions, can outlive their human caretakers and survive for a lifespan of one hundred years or more. However, kept in captivity, many only live up to forty to sixty years. This is due to poor diet, dirty enclosures and changes in habitat. This puts a lot of stress on the animal, which result in lower than expected life spans.